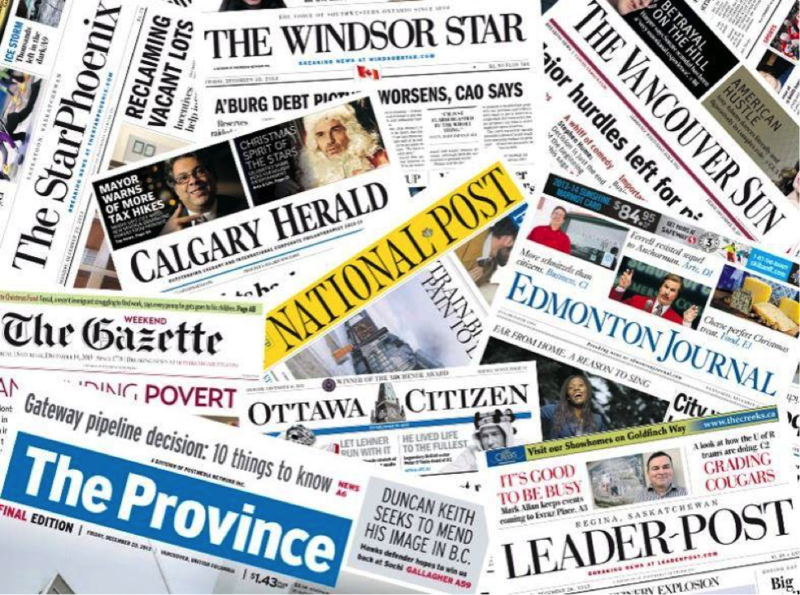 The future of newspaper dominated the discussion in Canada this past week, after Postmedia—the country’s largest newspaper chain—merged newsrooms in Vancouver, Ottawa, Edmonton and Calgary, laying off 90 journalists in the process. The cutbacks prompted a number of reporters and columnists to write about the death of journalism. One went so far as to say journalism wasn’t dying—it was being murdered by uncaring readers, advertisers who no longer buy ads, and craven governments. The future isn’t any better for broadcasters, by-the-way; TV stations say they lost $73 million providing local news across the country in the fiscal year 2013-14, and another $41 million in the six months ending in February, 2015. Adds the Friends of Canadian Broadcasting in a report to the CRTC,Canada’s media regulator: Nearly half of the country’s local TV stations could be off the air by 2020 without a boost in revenues to pay for local programming. While it’s easy “to find out about Prince Harry’s latest love,” it’s getting harder, he said, “to find anything about local school trustees or the latest local theatre production”—something newspapers “still do a pretty good job” at. As anyone who is slightly observant, the future for newspapers and TV news is bleak. As the CRTC observed: "Canadians sense that there is a weakening of the ecosystem for local news gathering, production and dissemination across all Canadian media." So: What’s the future of newspapers? That’s a big question. An important question. The question many are asking. But it might be the wrong question. Why was that a better question? It was a better question because the thing that needed to be asked about wasn’t one form of transportation—passenger trains—but about transportation itself. As we know, by the late 1960s the passenger train was mostly dead in North America, replaced by airplanes and highways. But while passenger trains ceased to be the main way people went from one place to another in Canada and the U.S., they still needed to travel between places—that need did not disappear, even though passenger trains as a form of travel faded away. It’s a similar situation for newspapers today, and maybe for TV news, too. Instead of asking what is the future of newspapers, the better question might be: What’s the future of sharing information? Why is this a better question? It’s a better question because the need for information will always exist, but the need for physical newspapers—like passenger trains—may not. People will still want information, in other words. They will just want it differently. Probably online, on tablets or phones. And they may even want different information than what newspapers and other forms of journalism are currently providing, as I noted in an earlier post. Figuring out how people will get information—and if they will pay for it—is another question altogether. So far, nobody has that answer. But pointing fingers at readers, advertisers and governments won’t get us anywhere. What we need to do is ask the right question. Update: The same week of the Postmedia cutbacks, the Nanaimo Daily News announced it would close after 141 years. A week later, the Guelph Mercury announced it was ending its print edition after 149 years.